Benet junior Bennett Curtis is the picture of youthful vitality as he competes on the soccer field, shouting instructions and encouragement to his teammates. Curtis was in eighth grade when he was diagnosed with Hodgkin’s lymphoma, a cancer of the lymphatic system. Thus began a harrowing and ultimately successful journey in which he received help from the Shining Stars Foundation, a Colorado-based charity that now has a rather devout local spokesman in the 16-year-old Curtis. The illness was first discovered during a regular doctors visit. Curtis received the shocking result November 14, 2012 – he will never forget the date – and began a battle no child should have to fight. “I didn’t know what to say, because I didn’t feel sick,” Curtis said. “Usually when you think of somebody with cancer, you think that they’re very sick, in the hospital. 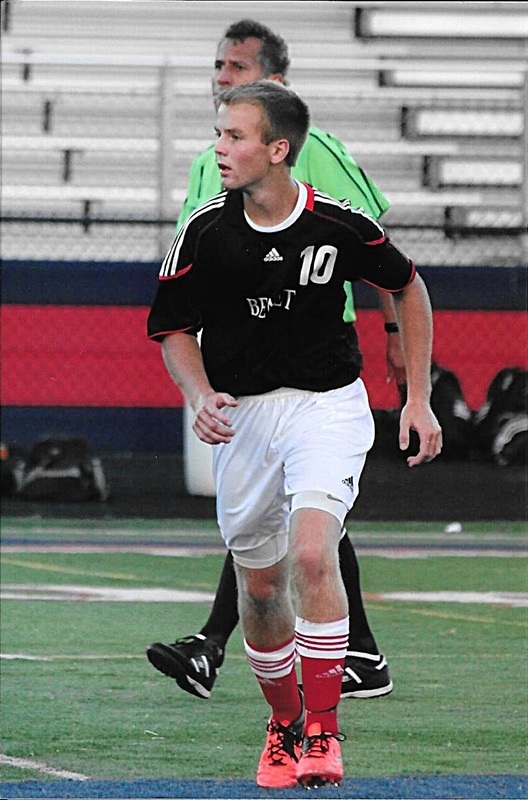 Soccer is a Curtis family passion and, as it helped Bennett during his fight. He has been in remission for 2½ years. Curtis’ father, Jim, played soccer in college and all four of his children took up the sport. Daughter Emily played at Benet and is continuing her career at Illinois Wesleyan. Another daughter, Abby, is a seventh-grader and Bennett’s younger brother, Nate, is a sophomore at Benet who recently stopped playing. The fight was far from easy. Curtis underwent nine weeks of chemotherapy at Lurie’s Children’s Hospital, followed by 14 days of radiation at Northwestern Memorial Hospital. That treatment, along with the fact the cancer was detected fairly early, allowed Curtis to be declared cancer-free in March, 2013. While Curtis is relieved that his ordeal is over, he realizes that his battle with cancer changed him. Soccer played a big role in his recovery. “He’s a fighter,” Jim Curtis said. “Through all the treatments he never stopped playing, couldn’t stop playing. Though he couldn’t play in matches, Curtis participated in indoor training when he could. Through it all, Curtis was buoyed by the support of his father and mother, Debbie, who were scared but steadfast. “Obviously, my parents are phenomenal,” Curtis said. “They love me and I love them. The family also found support from the Shining Stars Foundation, which was established in 2001 to provide athletic opportunities for sick children. Shortly after Bennett completed treatment, Shining Stars offered to send him on a trip to Aspen for its 2013 Winter Games, where he would spend a week skiing with 50 other kids from around the country with life-threatening illnesses. Volunteer chaperones would fly with him, but his parents would stay home. Debbie Curtis, wary of letting her son out of her sight, was opposed at first. “(Bennett) went out there, and every kid had cancer and was bald or walking around with disabilities. They do paraskiing for disabled people. The experience was an eye-opener for Bennett. Now Curtis wants to make sure other children have hope. He is determined to help the Shining Stars in any way he can. One way he will is through an event he organized to raise awareness and funds for the organization. It takes place Saturday, Sept. 26, when Benet hosts Notre Dame. Both teams will wear special T-shirts during warm-ups and Curtis plans to speak prior to the start of the 10 a.m. game. Informational brochures will be handed out and donations accepted. Others are impressed and appreciative of Curtis’ efforts. “Bennett is a truly inspirational young man and has such a big heart,” said Megan Bryant, Director of Development at Shining Stars. “He has envisioned this entire fundraiser from the ground up, and we could not be more proud. “When we first met Bennett in 2013 at our Winter Games Program, he was a role model and mentor for other kids and has continued to use his experiences to impact and help others. His example inspires other kids battling cancer, helping them realize all they can accomplish and overcome. That impact will be substantial. Bryant said that the foundation has served more than 1,750 kids and 5,500 family members over the past 15 years and that demand for its services is increasing. “This event is significant to the foundation, as we are experiencing growing wait lists for our programs, despite having expanded our services by 25 percent in the last year,” Bryant said. “Funds raised will help us serve new kids in the coming year, many of whom are just starting their battle with cancer. Benet coach Sean Wesley is one of many people inspired by Curtis. To be sure, Curtis is serious about soccer and giving back to those who helped him, but he has never lost his sense of humor. When the Redwings were losing a big game last year, Curtis piped up before Wesley began his halftime speech. It is one thing to hear about the challenges that other people go through, but quite another to experience it yourself. Bennett Curtis is now one of those caring folks who support those around them, regardless of whether they are healthy or ailing. “He has a huge heart and just the way he treats all his friends and all his teammates is awesome,” Wesley said. “He’s selfless to go through (cancer) and be worried about everybody else and so willing to do kind of the dirty work (of fundraising).